Funeral for former Manitou resident Velton J. Woodmore, 99, Plano, Texas, will be at 11 a.m. Tuesday at the United Methodist Church, Manitou, with the Rev. David W. Jones, pastor, officiating. 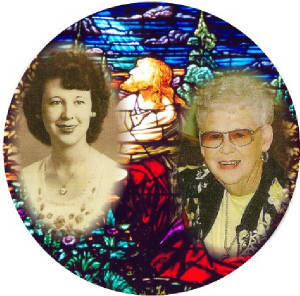 Mrs. Woodmore died Nov. 3, 2011, in Plano. Burial will be at the Frederick Memorial Cemetery under the direction of Orr Gray Gish Funeral Home. She was born Dec. 1, 1911, to Benjamin Franklin and Hester Euran Mills Johnson, in Nacogdoches, Texas. She attended school at Manitou and graduated from Manitou High School. She married William Lawrence Woodmore Aug. 7, 1938 in Manitou. She was a member of the United Methodist Church in Manitou. She loved quilting which she practiced with the women of the Manitou United Methodist Church for families in need of quilts. She was a devout Christian who studied the Bible faithfully and served at her church as the children's Sunday school teacher for much of her adult life. 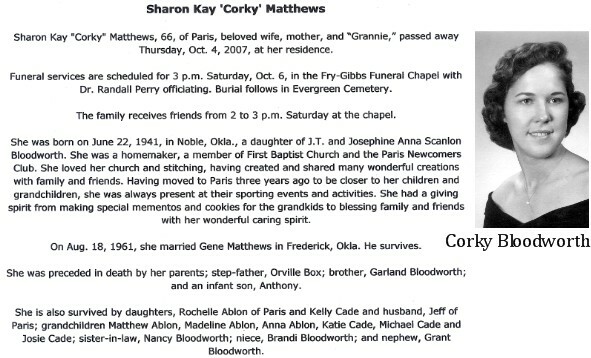 To all of her extended family she was a wonderful mother, grandmother and great grandmother. She had a wonderful sense of humor and zest for life, and deep love and compassion for her family and friends. We know she is now at peace, but she will be truly missed by all those who have had the blessing of knowing her here on this earth. Survivors include a daughter and son-in-law: Willene Laura and John J. Hawk, Plano, Texas; two grandsons and their spouses: Eric and Lani Hawk, Frisco, Texas and Cody and Kathie Hawk, Frisco, Texas; two great-grandsons: Mitchell Hawk and Will Hawk, Frisco, Texas and a great-granddaughter: Kyler Hawk, Frisco, Texas. She was preceded in death by her parents; her husband, William Lawrence Woodmore and three sisters: Lear Ann, Cleva and Thelma Irene Johnson. James Alex (Bud) Schritter, age 83, died Monday, October 3, 2011, at an Oklahoma City hospital after a period of failing health. He was born February 17, 1928 in Manitou, OK to Alexander and Mary (Darick) Schritter and grew up in Manitou, where he attended and graduated from Manitou High School. He came to Mustang in 1948 where he farmed and worked in the oil field. Bud was preceded in death by his parents, one daughter Debbie, four brothers Harold, Bob, Ed and Henry, three sisters Frances, Irene and Opal. He is survived by his wife of nearly 60 years, Norma of the home, one son, Ernie Schritter and fiance Terry Lynn Bush of Mustang, two grandsons, Cory and Chase and one great grandson, Dean. Also by two sisters, Mryle Farley and Nola Watson both of Norman. 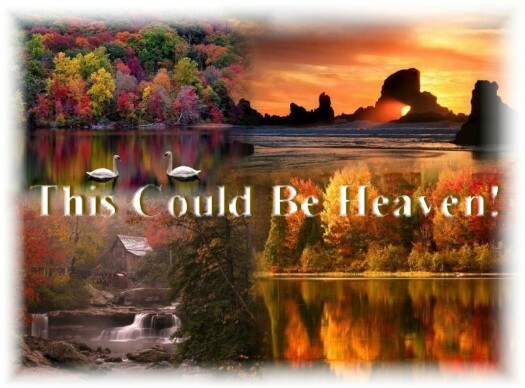 Sandra Moix, 68, of Greenbrier, went to be with the Lord, October 7, 2011. She was born December 10, 1942, in Manitou, Oklahoma, to the late Donald and Erma (Harper) Nelson. She was a homemaker and loved all animals. Sandra is survived by her husband of 45 years, Gerald E. Moix; three children, Gela Nelson, Ginger Moix and Gerald M. Moix; three grandchildren, Lewis Nelson, Landon Bolden and Karlee Moix; and a sister, Ann Story. Graveside service for Marilyn Claunch, 76, Frederick, will be at 10 a.m. Saturday at Frederick Memorial Cemetery with Dr. Eric Snyder officiating. Arrangements are under direction of Jackson Funeral Home of Frederick. Mrs. Claunch passed away Wednesday, Oct. 5, 2011, in Frederick. Marilyn Yvonne Doyle Claunch was born June 12, 1935, near Hollister to Calvin and Vivian Ulrich Doyle. She attended elementary school in Frederick and high school in Manitou. She had worked at Memorial Hospital & Physicians Group in the business office for several years. Later she volunteered at the Tillman County Pioneer Townsite. Marilyn was a member of First United Methodist Church in Frederick. She is survived by one son, Collin Claunch and his wife, Tammy, of Frisco, Texas; one daughter, Cindy Claunch, of Ardmore; one brother, Lee Doyle and his wife, Barbara, of Leander, Texas; two sisters: Wiletta Schrick and her husband, Kenneth, of Frederick; and Karen Whitehead and her husband, Bud, of Abilene, Texas; 10 grandchildren; and one great-granddaughter. Mr. Neugebauer died Monday, April 19, 2010, at the Jackson County Memorial Hospital, in Altus, Oklahoma. Private burial will be at the Manitou Cemetery under the direction of Orr Gray Gish Funeral Home. 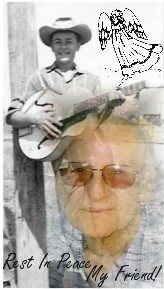 He was born June 24, 1946, to George Neugebauer and Faye Etta (Dosher) Neugebauer, in Frederick, Oklahoma. He attended Manitou Schools where he graduated from Manitou High School. He served honorably in the United States National Guard. He was united in marriage to Susie Ward in 1967, at Roosevelt, Oklahoma. He worked with the family business of custom wheat combining and later owned and operated a paint business. He was mechanically inclined and enjoyed working on cars. He was a member of the First Baptist Church, Manitou, Oklahoma. He was preceded in death by his parents; two brothers: Benny Neugebauer and Ronald Keith Neugebauer. 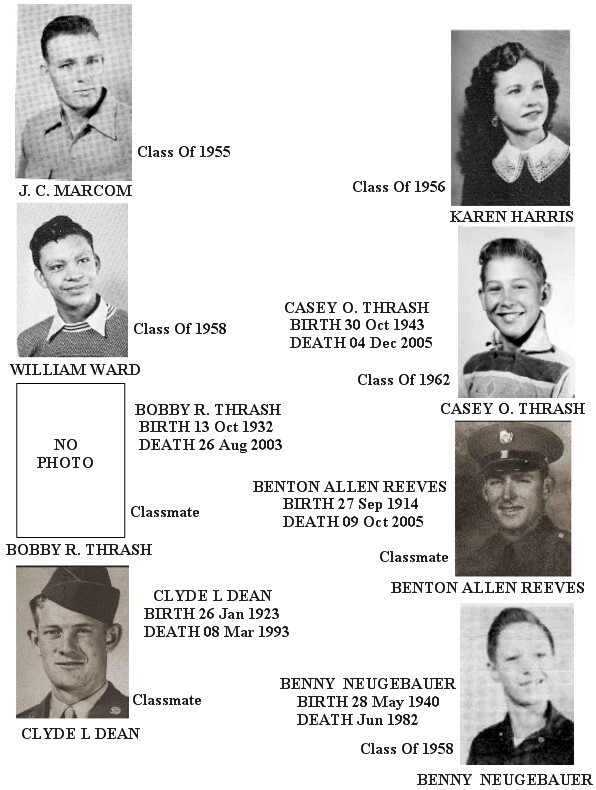 He is survived by a daughter: Keri Wenner, and her husband Patric, of Woodward, Oklahoma; one son: Sean Neugebauer, of Tulsa, Oklahoma; four sisters: Joetta Mashburn, and her husband Monroe, of Quincy, Washington; Onita Burden, and her husband Lee Wayne, of Manitou, Oklahoma; Pat Valentino, and her husband Anthony, of Manitou, Oklahoma; and Nettie Ann Stiebens, and her husband, Jerry, of Manitou, Oklahoma; two grandchildren: Madison and Mackenzie Wenner. Please let the song (Mansion Over The Hill Top) play out before viewing video! Funeral services for Melisa Ann Bray, age 30, of Mundelein, Illinois, formerly of Manitou, Oklahoma, will be held 1:30 p.m. Wednesday, March17, 2010, at the Manitou United Methodist Church, with Dean Newville, officiating. Burial will be in the Fairlawn Cemetery, Snyder, Oklahoma, under the direction of Orr Gray Gish Funeral Home, of Frederick, Oklahoma. The family will receive friends from 6 to 8 p.m. Tuesday evening, at the funeral home. 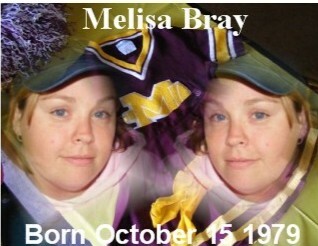 Melissa passed away Wednesday, March 10, 2010, in Illinois. She was born October 15, 1979, in Coalgate, Oklahoma, to Billy Dale and Shirley Ann (Meeler) Bray. She moved with her family to Manitou at an early age in 1982. Melisa attended Manitou grade school from 1985 to 1993; she attended Tipton schools from 1993 to 1995; at the age of 16, Melisa was in a life threatening car accident and sustained injuries that paralyzed her from the chest down; she then attended Frederick High School from 1996 to 1999, graduating in 1999. After high school graduation, she attended Western Oklahoma State College, in Altus, Oklahoma, and graduated in 2002. On March 4, 2001, she met the love of her life, which she had become acquainted with just a few days earlier on the internet. It was “love at first sight,” and she began a relationship with a new lifelong partner William Moore, who was stationed in the Army at Fort Sill, at that time. Then in June 2003, she and Will moved to Illinois. Melisa’s activities include: chatting on-line, talking on the phone, traveling, shopping and going to downtown Chicago and spending the day. Other interests include: collecting angels, going to concerts, going to professional sporting events, and going to new places to meet new people and make new friends. She aspired to be a teenage counselor so she could teach others from her past experiences. She and Will had four furry children, their doggies: Kujo, Spike, and Trigger; and a cat Pepper. She is survived by her husband: William Moore, of the home, in Mundelein, Illinois; her parents: Billy & Shirley Bray, of Manitou, Oklahoma; two brothers: Billy Bray, Jr. and wife Cherie Bray, of Atlus, Oklahoma, and Gary Bray and wife Brandi, of Frederick, Oklahoma; father and mother-in-law: Bill and Vickey Moore, of Round Lake Beach, Illinois; two brothers-in-law: Kevin Moore and Kerry Moore, both of Mundelein, Illinois; and one sister-in-law: Tiffany Moore, of Roselle, Illinois; four nephews: Gregory and Christopher Bray, Timothy and Lorenzo Moore; and four nieces Alyssa and Mikeala Bray, Serena and Lillie Moore. Memorial contributions may be made to the charity of the donor’s choice, in loving memory of Melisa Ann Bray. Word has been received of the death of former Manitou resident Earl Dean Courtney age 72 of Oklahoma City. 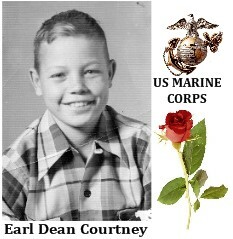 Mr. Courtney died Thursday, January 7, 2010, in Oklahoma City. A memorial service will be held at a later date. He was born on December 24, 1937, to Claude and Addie Courtney of Manitou. After graduating from Manitou High School in 1958, he joined the United States Marines. He later worked for Frisco Railroad for many years. 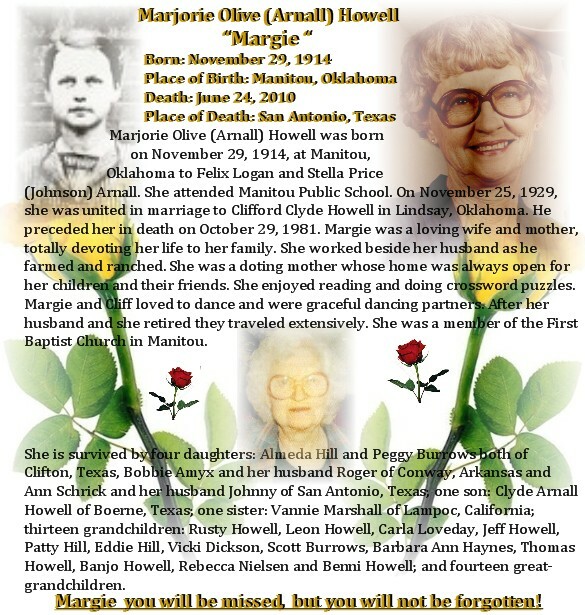 He is survived by a daughter Sherry and a son Robert Earl; four sisters, Maxine Rose of Tipton, Oklahoma, Charlene Burkhalter of Dalhart, Texas, Pauline Cook and Marlene Sayer both of Yukon, Oklahoma; a brother, Claude "George" Courtney of Oklahoma City, Oklahoma; and a host of nieces and nephews. Elizabeth Annrene (Neumeyer) Cardwell was born March 28, 1923, at Manitou, Oklahoma to William and Augusta Evans “Eva” (Shannon) Neumeyer. She attended Manitou Public Schools, graduating from Manitou High School. She later attended Draughon Business College in Oklahoma City. On January 20, 1947, she and Duane Cardwell were united in marriage at Wichita, Kansas. Mr. Cardwell preceded her in death on July 13, 2003. Annrene was employed as a teachers aide for Frederick High School; she later worked for many years for the Department of Human Services. After her retirement she worked as a receptionist for First Southwest Bank in Frederick. She was a member of the First Baptist Church in Frederick; a former member of the Eldercare Board and Memorial Hospital Auxiliary. She served as a Tillman County Election Official on the Manitou Precinct. She is survived by one daughter and son-in-law: Dianna Darlene and Buddy Ebarb of Manitou, Oklahoma; one son and daughter-in-law: Randy Duane and Mary Cardwell of Electra, Texas; four grandchildren: Patrick Jamison Scott, Darla JoAnn Strange, Shannon Bell Cardwell and Kristoffer Michael Masch; one step-granddaughter: Rebecca Ebarb; four great-grandchildren: Caleb Jamison Scott, Jessica White, Colton Duane Strange and Carter D. Strange; and one great-great-grandson: Trey A. White. Was born July 4, 1946, at Frederick, Oklahoma to Clifford Clyde and Marjorie (Arnall) Howell. 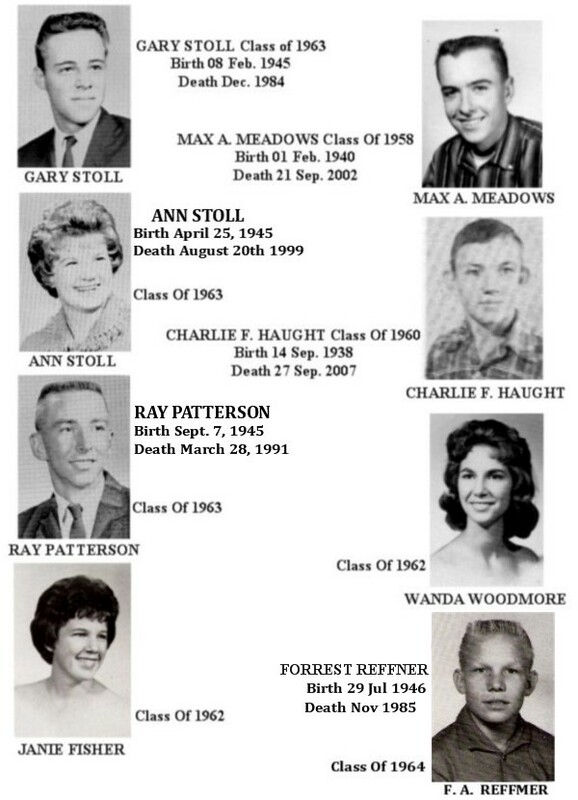 He attended Manitou Public School, graduating with the Class of 1964 as Salutatorian of his class. He served in the United States Navy during the Vietnam Conflict. On March 5, 1976, he and Mary Ann Love were united in marriage at Vernon, Texas. Lucky worked as a sandblaster/painter. He later manufactured horse trailers, retiring in 1992. Lucky was a Baptist. 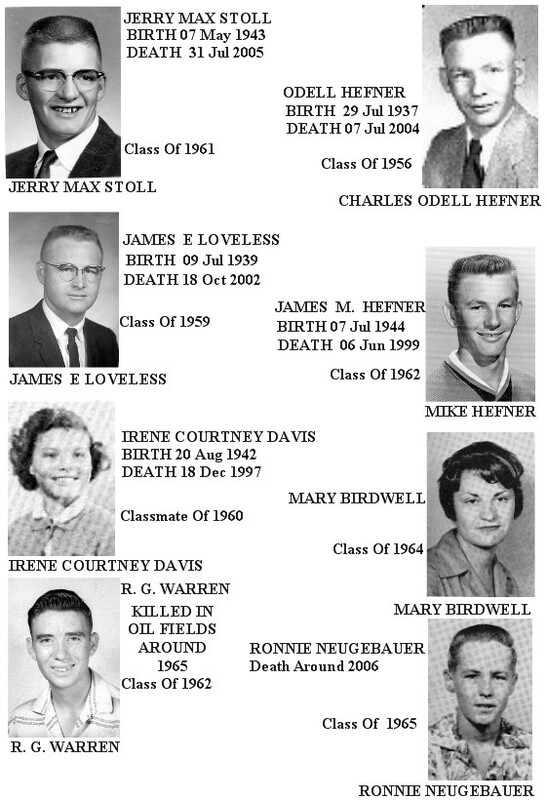 He is survived by his wife Mary Ann Howell; his mother: Marjorie Howell of San Antonio, Texas; two sons and daughter-in-law: Thomas and Jennifer Howell of Fort Sill, Oklahoma and Banjo Howell of Manitou, Oklahoma; two daughters and son-in-law: Rebecca and Michael Nielsen and Benni Colleen Howell all of Omaha, Nebraska; a brother: Clyde Arnall Howell of Burney, Texas; four sisters and brothers-in-law: Almeda Hill and Peggy Burrow both of Clifton, Texas, Bobbie and Roger Amyx of Conway, Arkansas and Ann and Johnny Schrick of San Antonio, Texas; and four grandchildren: Keylie Weydert, Shooter Neilsen, Anabell Howell and Colin Howell. He was preceded in death by his father: Clifford Clyde Howell; three brothers: Logan, Lonnie and Carl “Choppy” Howell; and a brother-in-law: Gavin Burrow. John Phillip Jones, 76, passed away Sunday, December 28, 2008. He was born July 6, 1932 in Vanoss, Oklahoma to Marvin and Rachel Jones. He graduated from Manitou High School in 1950 and has been residing with his wife, Kim, in Aurora, Colorado for the last several years. John was preceded in death by his parents, Marvin and Rachel Jones of Manitou and by his oldest sister, Marvine of Hemet, California. John is survived by his brother and three sisters; Bertie Lou Smith of Tulsa, Wanda Matheson of Amarillo, TX,. Joe Bailey Jones of Las Vegas, NV. and Helen Allard of Edmond as well as his seven children; Phillip Wayne, Steven, Ronnie, Christopher, Salvador, Miranda and Jennifer Jones.